Subduction is a fundamental geological process generating and modifying continental crust and associated with severe natural hazards including earthquakes, volcanoes, and tsunami.The portion of a subduction zone capable of generating earthquakes (termed the seismogenic zone) is fairly restricted in depth but is responsible for releasing ~90% of the earth's seismic energy. Global observations at subduction zones reveal a large range in seismogenic behavior with variations in maximum earthquake magnitude, repeat time, and slip distributions. My research focuses on fundamental processes controlling earthquake occurrence and the large variations in earthquake behavior. 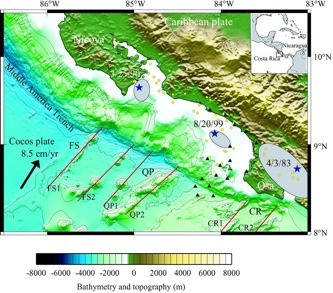 Specifically, with many collaborators, I have been investigating the detailed seismic structure and seismic and geodetic behavior of the northern Costa Rica seismogenic zone. Using seismic tomography (DeShon et al., 2006), receiver function analysis (Linkimer et al., 2009) and integrated GPS modeling and seismicity studies (Newman et al., 2002; Bilek aet al., 2003; Norabuena et al. 2005; Deshon and Schwartz, 2004; Schwartz and DeShon, 2007; Outerbridge et al., 2009) we have learned that subduction of lithosphere with different genesis and therefore different geomorphic features, level of hydration and temperature profiles produce significant changes in seismic behavior.